A porch addition is one way of creating a small outdoor living space that projects a more intimate setting. It isn’t as wide or spacious as a patio, but it can still serve as a cozy venue for porch parties among neighbors or hang out place for family members. Open porches provide extra floor spaces and give the house an open look. A porch with balustrades or railings is ideal as play area for children and pets. Materials for railings can be aluminum, wrought iron, wood, stone or concrete, or glass panels with steel brackets,. For additional protection, you can opt for a screened porch. This keeps out unwanted insects like mosquitoes. It’s the ideal choice particularly if your home is located close to the woods. A wrap-around porch offers a lot of possibilities. Since it spans the whole perimeter of the house, you can have a quiet reading nook on one side, a place for a porch party on another side. A small play area with kiddie swings, rugs, and throw pillows can be delegated as the kids’ play area. 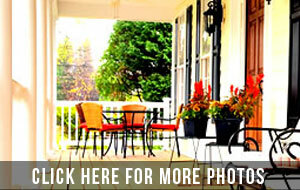 Patio Creations will install your porch so that seamlessly blends with the design of the main house. Porch materials include PVC and other synthetics, IPE wood or iron wood—a more environment-friendly material, or modified wood. For more information about our Woodlands screened porches, call or drop by our office. You may browse through the porch gallery first on this website to check out our various porch designs. Or feel free to discuss you own designs with us so we can help turn it into a reality. Our consultations are risk-free, no-obligation meetings. We’re glad to be of service.